Dr. Melmed is on on faculty at Arizona State University and the University of Arizona in Tucson. Dr. Melmed earned his medical training at the University of Cape Town, South Africa, and completed a fellowship at Children's Hospital Medical Center in Boston, where he was an Instructor at Harvard Medical School. He is a member of the Society for Developmental and Behavioral Pediatrics and a fellow of the American Academy of Pediatrics He is board certified in Pediatrics and Developmental and Behavioral Pediatrics. Dr. Melmed has set up nationally recognized physician training programs for the early identification of infants and toddlers with developmental and behavioral concerns and authored a program geared toward the early screening for autism spectrum disorders. He is the author of Succeeding with Difficult Children, Autism: Early Intervention, Autism and the Extended Family and Marvin's Monster Diary-ADHD Attacks. His latest book for children, Timmy's Monster Diary: Screen Time Attacks!, will be published in the fall of 2017. Dr. Melmed is an investigator of novel psychopharmacological agents in the treatment of autism, Fragile X and ADHD and collaborates on studies of tools used in the diagnosis of developmental disorders. Founder, Break the Cycle of Health Disparities, Inc.
Atlanta, GA Dr. Rubin is originally from South Africa where he trained in Pediatrics and immigrated to the USA in 1976. He was initially at the Hospitals of the Case Western Reserve University in Cleveland Ohio. In 1980 he moved to The Children's Hospital in Boston and the Harvard Medical School where he spent 14 years. He has been in Atlanta, Georgia since 1994 where he was on faculty at Emory University until 204 when he joined the Morehouse School of Medicine. He is a Developmental Pediatrician who is committed to serving children and adults with developmental disabilities, their families and their communities with a particular focus on the environmental impact of social and economic factors on the health, growth and development of children. The purpose of these lectures is to teach appropriate, comprehensive, compassionate family focused and culturally competent medical care for patients with developmental behavioral and educational challenges. Through disease state education, physicians will feel more comfortable with the presenting conditions and will be able to incorporate evidenced based care, medical treatments and “caring” for those with these conditions such as Autism Spectrum Disorder in children and adults and ADHD. Almost by definition these conditions require collaboration with providers outside of the traditional office setting including psychologists, school personnel, speech and occupational therapists. The physician's role in being able to provide a medical home for those patients and in be being able to communicate with entire team will be emphasized. The same principles hold true in being able to collaborate with the multiple medical specialists so often seeing the patient, for example, the children with ASD who have severe gastrointestinal challenges along with seizures. Children with developmental disabilities represent a diverse population with a variety of causes, a variety of conditions and a wide range of developmental, behavioral and medical manifestations. The care of children with developmental disabilities, therefore, requires an appreciation of the complexities of diagnosis, and management involving medical care, promotion of optimal development and education, and attention to social, emotional, environmental and economic factors that influence the children, the family and the community. This series of lectures will provide for the audience a framework for understanding the complex set of conditions characterized as developmental disabilities. In addition, there will be an orientation to the genetic and environmental factors that result in developmental disabilities and we will offer strategies for addressing these challenges to promote optimal health and well being for the children. Zadar, Croatia - Zadar is blessed with beautiful natural surroundings. 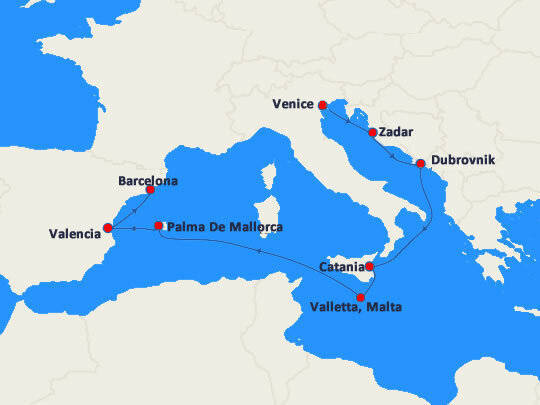 The city faces an Adriatic archipelago that is one of the best sailing areas in the world. With its mild winters and warm summer, Zadar offers inhabitants and visitors an excellent environment for work and leisure. Zadar is bordered by four national parks: the untouched Kornati Islands, the breathtaking Velebit mountains, the winding Krka River and the peaceful Plitvice Lakes. Other natural sites include the canyon of the river Zrmanja and the caves at Cerovac. These places are ideal for swimming, diving, boating, surfing, tracking, climbing and even skiing.